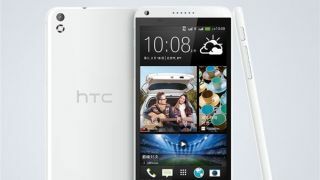 HTC Desire 8 is coming - but at MWC or in China? It would appear that the HTC Desire 8 that broke free last week has been pretty much confirmed by HTC itself. We know that firms like to try and sneak in little details about upcoming announcements inside teasers such as screen shots, and it looks like HTC has done just that on its Weibo account. Pictures posted to the feed, and spotted up by G for Games, not only seem to confirm the Desire 8 moniker but also an MWC 2014 release. The clue is in weather, shown for 24 February (the opening date of MWC 2014) albeit for Beijing rather than Barcelona. As the report points out, it is highly unlikely that HTC will run a separate event the other side of the world when everyone's eyes and ears will be on MWC. The Desire 8 could be a China-only device though, something that makes sense given the clamouring for larger screens in Asia. We hope that isn't the case with rumours of a 13MP rear and 5MP front camera wrapped in a reasonable price tag certainly giving enough reason to pay attention - the other alternative being that a smaller version will be release in Europe, although we've not heard as much on such a thing. HTC may also be hinting at more than just the pixel size of the front camera with a rough translation saying "I like to take pictures and I also like to show the essence of selfies". Suggestions are that this is a 'beautification' mode, although we'll wait until an official announcement before we put the salt away there. If an MWC announcement is on the cards you can guarantee we'll be there to bring you all the news. The Desire 8 might make an appearance but we don't expect to see the HTC One 2 there.